Blood flows freely; limbs tear from torso; glass, nails, needles puncture young flesh. 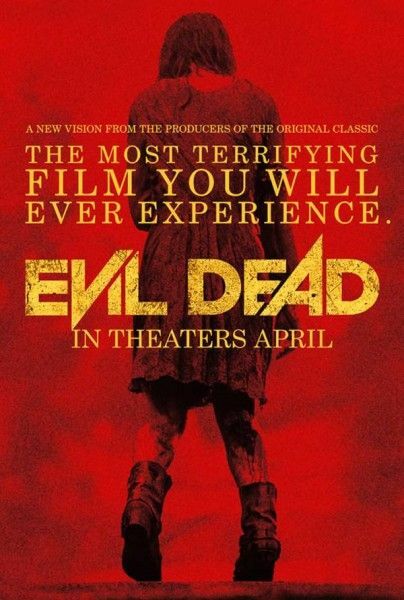 Evil Dead, Fede Alvarez’s remake of the Sam Raimi classic, more than lives up to its predecessor’s quota for gore. There’s a new charm to this flick. Gone is the original’s shaggy, dirty, almost dangerous feel. This new entry is slicker, more composed, somehow safer. It’s strange to describe a film where a girl cuts off her own arm as ‘feel good’ – but the violence is so pronounced, so gruesome it transcends horror into something akin to catharsis. The story is ostensibly the same: a group of twentysomethings (here played by Shiloh Fernandez, Jane Levy, Lou Taylor Pucci, Jessica Lucas and Elizabeth Blackmore) take refuge in a cabin, only to accidentally unleash the malicious possessing demons in the surrounding woods. One by one, they are possessed and mutilated. It’s a simple yet perfect setup – and the film makes ample use of finding new and increasingly unseemly ways to off these poor kids. As the body count rises and literal buckets of blood rain onto the remnant survivors, it’s impossible not to smile at the sheer audacity of grue on display. At the film’s press day, director Fede Alvarez and star Jane Levy discussed the process of creating a prosthetic/gory moment, recreating moments from the original film and what tone a hypothetical sequel would take. For the full interview, hit the jump. 03:03 – Alvarez on transitioning from short films to features.